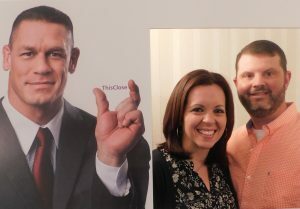 Wood County Rotary Club President Sharon Anderson and her husband Terry get their photo with John Cena. A total of 33 Rotarians and 16 guests were on hand to enjoy a tailgate-themed dinner at the local Country Club. The two clubs set a goal of raising $750 to contribute to the fight to eradicate polio. Rotary Club of Parkersburg president, Jill Parsons was happy to report that the two clubs raised a total of $1,150, with more contributions still coming in by other club members who weren’t able to attend the event. Stacy DeCicco, Rotary Club of Parkersburg member who is director of the United Way Alliance of the Mid-Ohio Valley, shared a new on-line giving portal that allows attendees to see in real time how contributions add up at an event compared to a goal. The two clubs used the portal and could see the “thermometer” racing for the goal of $750 as attendees arrived and their donations were captured. Imagine the excitement when the projected goal was within a few dollars, then the upward momentum of the thermometer as the clubs surpassed it! Once submitted to Rotary International, the donations will be matched 2:1 by the Bill & Melinda Gates Foundation, which means at least $3,450 will go toward the fight to eradicate polio from the Wood County and Parkersburg clubs! 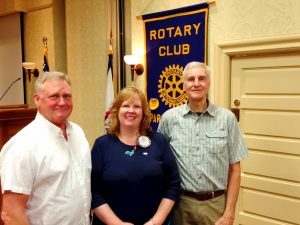 Fenton Foundation representative, Tom Fenton (right) joined Parkersburg Rotary Club officials Jill Parsons and Robert Newell during the club’s July 24 meeting to announce a $1,000 donation to Drug Free Schools of America service project. PARKERSBURG —Williamstown’s Fenton Foundation is the latest organization to join with the Parkersburg Rotary Club Drug Free Schools of America (DFCA) drug prevention program in local high schools. The Foundation recently contributed $1,000 to the Rotary Club to further its DFCA efforts at Parkersburg South and Parkersburg High Schools. The drug prevention program currently has 200 students enrolled in the program while anticipating more students in the upcoming school year. “We appreciate the generous contribution to DFCA and Rotary from the Fenton Foundation,” said Rotary Club project coordinator, Bob Newell. “We have collaborated together on the serious drug epidemic facing our valley. Tom has taken the lead in Williamstown forming a variation of Parkersburg’s Drug Free Clubs initiative called Drug Free Jackets, Inc. We wish them success, and will continue to collaborate for a future drug free generation of kids,” Newell added. Drug Free Clubs of America is a voluntary program established in 2005, in which high school students with parental permission submit to voluntary drug testing. In all, nine high schools in West Virginia are participating in DFCA. “Fenton Foundation is pleased to support the Drug-Free Clubs of America chapters at PHS and PSHS and the Drug-Free Jackets initiative at Williamstown High School,” said the Fenton Foundation’s Tom Fenton. “If you are wondering how to reduce the number of Wood County students headed for a life of addiction and crime, then student drug-screening is certainly part of the answer. Parents often don’t know; drug-screening offers new information to parents who want to take action,” he emphasized. As a Rotarian at the Marietta Noon Club, Fenton is familiar with the mission and goals of Rotary and the impact that service projects can have. Drug Free Clubs of America is designed as a “full circle” approach to drug prevention. The strategy surrounds every different type of student with protection throughout their day. On test day, students are often surprised to learn that their membership in DFCA is something they now have in common with others to which they never felt similar. By bringing together school, parent, and community efforts, members benefit from an overall positive sense of belonging regardless if they are at school, at home, or out enjoying their community. The Rotary Club of Parkersburg was founded in 1919, and is one of the area’s oldest volunteer service organizations that brings business people from various occupations together to exchange ideas, build relationships, and take action both locally and globally.